It’s almost impossible for anyone currently living to appreciate the scope and breadth of Pete Seeger’s life and the legacy it encompasses. He is one of the last public figures whose career began before the bombing of Pearl Harbor. Off the top of my head, the only other living people on that list are Shirley Temple, Mickey Rooney and Jake Lamotta. The first two were child actors in the 1930s, and the last was a prizefighter who began making a name for himself in 1941, but whose main claim to fame came from being portrayed by Robert DeNiro some 40 years later in the film Raging Bull. Of these four, Pete Seeger was the first-born. Of these four, Pete Seeger was the only one whose celebrity came from what might be termed an intellectual pursuit, and he was almost certainly the only one of these four politically aware enough to be advocating for the Republicans at the onset of the Spanish Civil War. And of these four, Seeger was the only one still making public appearances in the 2000s, all the way through 2013 in fact, with his final performance occurring at Farm Aid on Sept. 21 alongside Willie Nelson and Neil Young. Pete Seeger was a Zelig-like presence over the course of the American Century, maintaining a persona that intertwined politics and entertainment in a way that few ever have, and doing so from the time of FDR’s Presidency right up through Barack Obama, whose inauguration he performed at in 2009. Zelig-like indeed. There he is hopping freight trains in the 1930s with Woody Guthrie. There he is performing in the White House for Eleanor Roosevelt. There he is, again with Woody and with Paul Robeson being pelted with rocks by KKK-sympathizers in Peekskill, NY. Nine months later, there’s his voice coming from every jukebox in postwar America, as “Goodnight Irene” topped the charts for 13 weeks on its way to becoming the then biggest selling single since WW2. And there he is in 1954, appearing before the House Unamerican Activities Committee and refusing to name names. There he is at Carnegie Hall in 1963, leading the now resurgent folk music/civil rights movement. And there he is two years later at the 1965 Newport Folk Festival, the day Dylan went electric and the psychedelic era began. That was a day when popular legend has Seeger pulling the plug on Dylan’s guitar amp in a futile attempt to keep the folk movement, and the ’60s, pure. And, nearly 70 years after performing for Eleanor Roosevelt, there was Pete Seeger at Barack Obama’s Presidential inauguration in 2009. 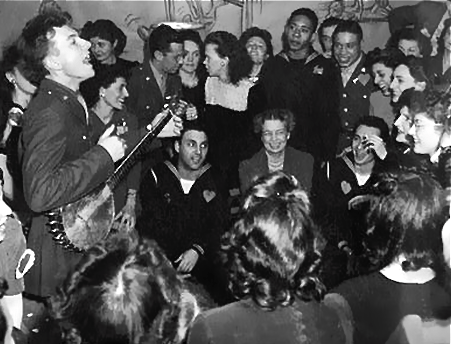 Seeger entertaining a group that includes First Lady Eleanor Roosevelt. My last glimpse of Pete Seeger was also Zelig-like, and came when this contemporary of Woody Guthrie appeared on that organ of current pop culture, the Colbert Report, in August 2012. There he was at the age of 93, clear-eyed and robust, picking the banjo, singing, and bantering with Colbert before and after the song with a mind as sharp as a tack. And we did. Often. Sides A and B. For months, it seemed. So often that I think I can still name all the songs on the record, and can still recall Seeger’s spoken intros, even though I haven’t listened in over 40 years. It was certainly the first album I was aware of as an album. Of course, “Mail Myself To You” was merely the comic relief number on the record, while the rest of the songs were fairly heavy social fodder. Even if I didn’t quite get all the references as a five-year old, I sensed the gravitas, especially on Seeger’s rendition of Guantanamera. Pete Seeger had been playing music like that since before my mom and dad were even born, and there he was doing it again in 2012 on Colbert, ramrod straight and sparkly-eyed as always. There’s something almost miraculous about the visage of someone as fabled as Pete Seeger appearing on something as contemporary as the Colbert Report when you consider how far back his history goes. So far back that it easily gets lost in the fog of time and the crackle of fireside chats. 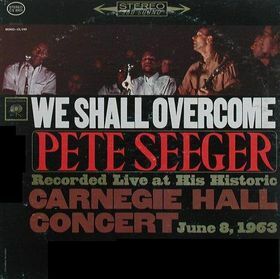 That 1963 Carnegie Hall concert was arguably Pete Seeger’s high water mark as a cultural icon. Civil rights marchers were changing America, and Pete Seeger was at the forefront. From then on, the culture went off in more decadent directions. The watershed event might have been the controversial 1965 Newport Folk Festival incident. Although Pete Seeger remembered the alleged falling out with Dylan in much less controversial and personal terms, 1965 did nonetheless represent a sharp divergence in popular culture. 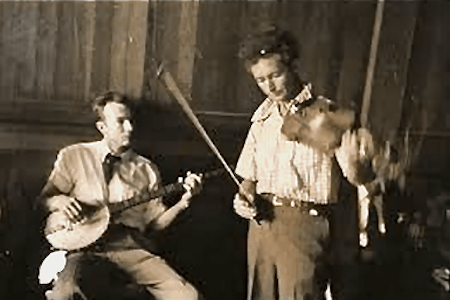 The protest movement Seeger had so strongly embodied morphed into something more youth-oriented, confrontational, self-indulgent, psychedelic, and clothing optional. By the end of 1965, Seeger’s brand of folk hootenanny–in fact all variants of blue-eyed folk music–went out of style faster than you could say Timothy Leary. After being more central a figure to the Civil Rights era as anyone outside of Martin Luther King, when the “don’t-trust-anyone-over-30” epoch suddenly began, Pete Seeger was “promoted” to symbolic figurehead, cool grandpa. His graduation to elder statesman was half a century ago. Two generations have grown up, gotten married and had children in the timespan that Pete Seeger has been the universal grandpa, and he never stopped making public appearances right up until a few months ago. In fact, there are probably few people alive who can remember a time without the elder-statesmanlike presence of Pete Seeger’s voice and visage on the scene. Most of the people alive today may know of Pete Seeger, but are too young to remember the American history that affected him and that he affected. We live in a different world now. Anyone under 55 has no recollection of the America Pete Seeger lived in and in many cases worked to change. Because we were born into a rights-based America (post-1960s) instead of a rules-based America (pre-1960s), we take it all for granted. Most of us know about the blacklisting era, but there’s no urgency to it. Those culture wars seem so academic now and long ago settled. No blood was spilled, and by the 1960s the counterculture ended up being the big winner anyway. But when Pete Seeger started out it was a very different America. It was Depression America. Seeger dropped out of Harvard for a chance to ride the rails with Woody Guthrie and see John Steinbeck’s America. It was an America fully insulated from the notion of civil rights, an America where the plight of the workingman was much more hand to mouth than it would be in the period of Postwar prosperity. Folk music was a political music, but it was also about the thrill of the road. It was the chance to hop freight trains and discover America. With Seeger’s first band, the Almanac Singers, folk music was cool, underground, and vaguely outlaw. With his next band, the Weavers, folk gained mainstream popularity, but remained subtly outlaw. Today, “If I Had a Hammer,” is just another quaint pop ditty. Few could imagine a time when this song would be perceived as a viable call to arms for the world’s disenfranchised and anti-capitalist masses. They were different times. The summer that “Goodnight Irene” broke through to nationwide success would have been around the time Jack Kerouac and the Beats were taking the road trips that would later be immortalized in “On the Road.” That book talked a lot about jazz, but it reads like a Woody Guthrie song, and that’s what people picked up on–the book’s desire to break free from the social hierarchy, take to the road, and see for oneself. The Beats were the artistic expression of Postwar America, and the Civil Rights movement was its political expression. Folk singers like Pete Seeger, Lee Hays, and Woody Guthrie were right in the crosshairs. Once the Sixties washed over America, the social landscape would never be the same, and folk music became quaint, formulaic, and even square. But there would have been no Sixties without the folk music scene kicking off the decade, and that’s an honor that belongs to Pete Seeger as much as anyone. In an era of musical heroes, Seeger could probably have capitalized greatly on his image as the father of protest culture, but he never did. There are two reasons for that: 1) He cared more about principle than fame, and 2) the House Unamerican Activities Committee blacklisting had a detrimental effect on his career. The second factor was a direct result of the first. Once subpoenaed to appear before the House, all Seeger had to do was provide an accounting of what he did and who he did it with, and he would have been given a clean bill of health. Cooperation was the course taken by the majority of figures called before the committee, including Seeger’s longtime folk music associate, Burl Ives. Ives went on to have a stellar Hollywood career while Seeger had to teach at music colleges to make ends meet after the blacklist. In the end, Seeger says, history was not kind to the House Unamerican Activities Committee and those who went along with it. Indeed, history was a lot kinder to Pete Seeger and his role in the Civil Rights movement. 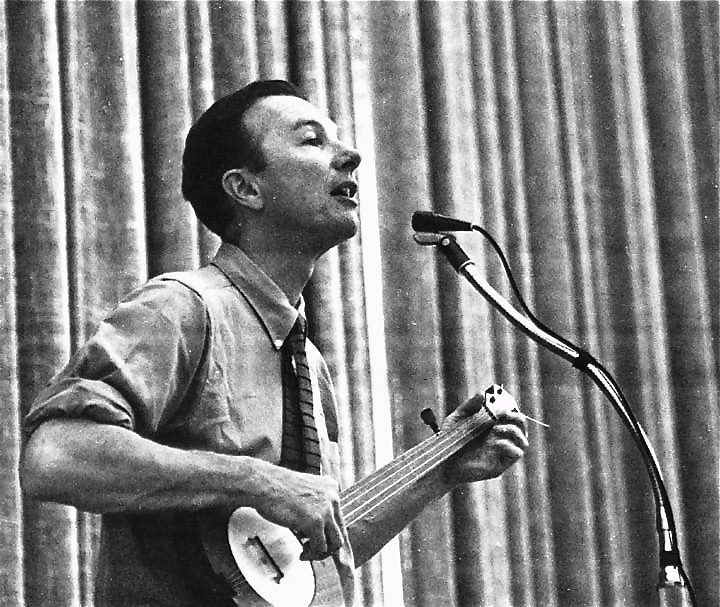 Pete Seeger prospered in ways besides Hollywood success. He prospered with an abundance of the two things that money can’t buy, time and health. He joined that rare breed who kept working into their 90s, and as far as I know he suffered from no medical conditions over the course of his long life. 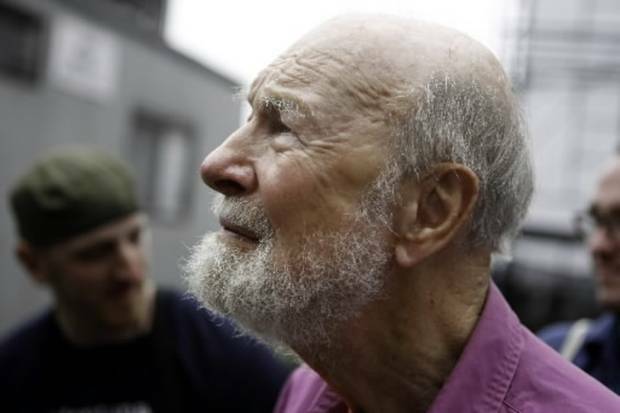 In late January 2014, Seeger took ill, was hospitalized, and died six days later in his sleep. According to his grandson, Seeger was healthy enough to be chopping wood at his own home just ten days prior to his death. With the passing of Pete Seeger, who remained lucid and accessible to the public until the time of his death, we lost one of the last direct links to Steinbeck’s pre-Pearl Harbor America. Fortunately, Seeger left us with eight decades of archives to pore over. Great piece Dave. A truly historic American. Not a huge “Folk” fan, but really one of my heroes. Thanks, Thomas. And I agree with you. We’re so used to deifying rock and pop stars and putting them on pedestals for really doing nothing noble or selfless at all, that it’s refreshing to have an example of a famous musician like Pete Seeger to remind us there’s a different way.